Young people aged 12-25 from across Scotland were invited to cast their vote using the single transferable voting system to elect a Member of the Scottish Youth Parliament (MSYP) for their constituency. With just three candidates choosing to stand across the two areas, this resulted in an uncontested election. More information about the work of the Scottish Youth Parliament is available on their website. 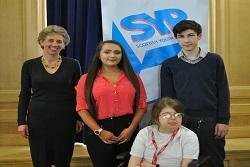 “Many congratulations to our newly elected MSYPs on their success, both individually and as a group. They are to be commended for their commitment to putting themselves forward for this unique and privileged position and I am sure they will make the most of the opportunity it gives them to raise awareness about issues affecting both their own lives and those of the people they represent. The recruitment process for the 2019-21 elections began in August 2018 when 10 young people submitted an initial note of interest. Following a selection and review process, three candidates eventually submitted an application to stand across the two constituencies. The Scottish Youth Parliament is the democratically elected voice of Scotland's young people and campaigns on a wide range of issues, and represents young people all over Scotland. It gives young people a national platform to voice their issues, turn them into positive actions, and influence Scotland's decision makers. The elected members of the Scottish Youth Parliament hold a two-year term in the position and are expected to represent their constituency by being an active community member as well as attending national Scottish Youth Parliament Sittings.